Lumigent is a robotic smart desk lamp, aiding you with your work with a camera and Wi-Fi. When you say "Alexa, ask Lumigent to turn on", it automatically transforms itself into appropriate positions determined by the voice it hears. Lumigent will also automatically adjust to preset brightness. A camera is mounted at the tip of the light and with that it can take pictures of documents on the desk and record any motions you make. 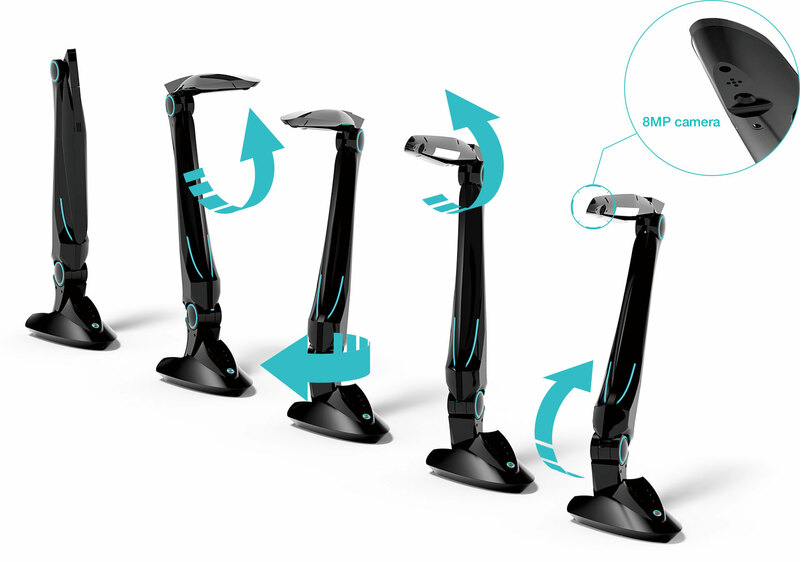 Lumigent intelligently adjusts its lighting angle and position by transforming the arm using the 4 motors inside, it can even memorize them based on your preference. You can preset lighting angles and positions to read a book, use a computer or any variety of tasks. All you need to do is say "Alexa, ask Lumigent move to preset "0". for example for using a computer (or for reading)". Lumigent captures everything on and around your desk via your voice commands with its auto-focus 8MP camera for shooting still photo, video and time lapse videos. Having a "smart eye" on your desk can revolutionize work collaboration, for example, artists and architects can share drawings captured by Lumigent seamlessly to cloud services via Wi-Fi, then ask Lumigent to switch to webcam mode to start a video conference.